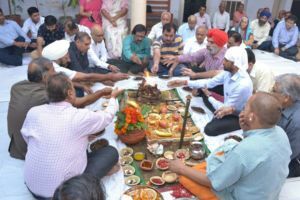 M M Modi College, Patiala organized Hawan Yajna on the conclusion of week-long celebrations of 142st Modi Jayanti on 21st October, 2017. Principal Dr. Khushvinder Kumar shared the philanthropic vision of Modi Education Society on the 51th Anniversary of the establishment of this college and its contribution in bringing the quality education within the reach of the public at large. The college organized Inter-Institutional Science Fair-2017, where 230 students from 20 schools and 8 colleges participated in this event. An Essay Writing Competition was also organized in which around 100 students of the college participated in English, Hindi and Punjabi Language. In English Section, Jaspreet Singh won 1st prize, Pahul P K Sandhu got second position and Sukhneet Kaur got 3rd position, in Hindi Section, Sakshi got 1st position, Ashita got 2nd position and Karan Sukhwal got 3rd position, while in Punjabi Language, Amanpreet Kaur got 1st position, Gagandeep Kaur got 2nd position and Birpal Kaur and Parminder Kaur got 3rd prize. The topics of Essay writing Competition were ‘Clean Environment and Citizen’s Role’, ‘Role of Literature in Personality Development’, ‘Craze for settling Abroad among Youth’. NSS Department of the College organized a blood donation camp on the request of Blood Bank of Govt. Medical College, Patiala. A team of doctors led by Dr. Navjot Kaur and Sh. Satpal Singh made arrangements for conducting the blood camp smoothly. 38 units of blood were donated by the students and the teachers. 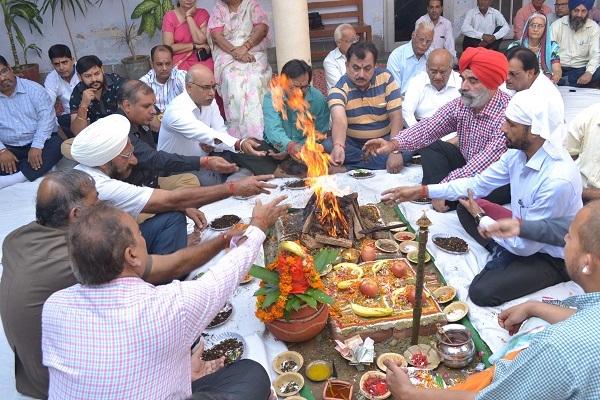 Large number of retired teachers as well as members of the staff and students were present on the occasion.